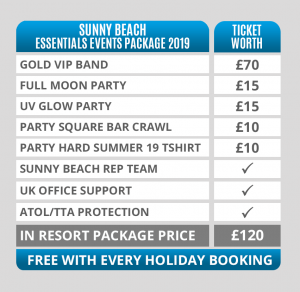 The Diamond Hotel is a 4 star all-inclusive hotel, perfect if you’re looking to spend your party holiday to Sunny Beach in luxury for an affordable price. With a large outdoor pool and bar, you can either spend your days relaxing with a few cocktails or take a five minute walk to the main strip filled with Sunny Beach’s renowned clubs, bars and restaurants. The Diamond Hotel’s 298 rooms are fitted with fridges, Wi-Fi, TV, mini bar, showers and of course a balcony. If you want your Sunny Beach party hotel to be more than a place to crash after a night out, The Diamond Hotel in Sunny Beach is equipped with a sun terrace, sauna, Jacuzzi, spa, fitness centre and a restaurant. The Diamond Hotel is also situated 10 minutes’ walk away from the blue flag beach which sits on the coast of the Black Sea, making it an ideal location to access everything in Sunny Beach. The Diamond Hotel has 5 floors and is also known for hosting events such as show cooking and themed nights, so keep an eye on the billboard inside the hotel! Please note, like almost all party hotels abroad, a conditional, returnable room deposit may be required on arrival (no more than €50pp).